On the outbound trip to Aqueduct Marina (near Nantwich, south Cheshire) a brilliant mooring spot had been sighted, a length of mooring with wide-reaching views overlooking the pretty village of Church Minshull. ‘Moor there on Friday once we’ve finished at the marina,’ was the thought. Keen to drum up business Aqueduct staff (repeatedly) offered a free overnight marina mooring. 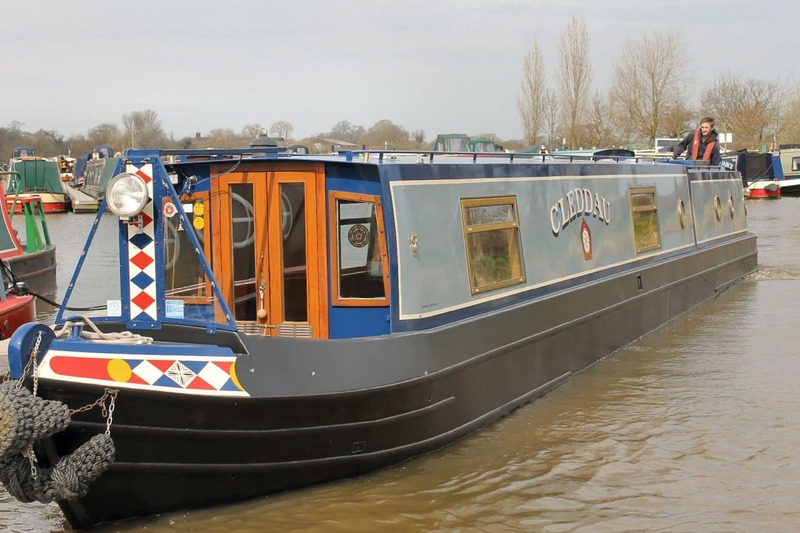 But the Cleddau crew politely rejected the offer, ‘much nicer to be out by a fine piece of towpath…’ was their thinking, and Cleddau was turned right back onto the Middlewich Arm to start her journey back to the Macc. A mile or so further on was the mooring site identified the previous day. How difficult could it be to moor in such an idyllic spot? Below the waterline lurked a length of infamous ‘Shroppie ledge’, set at a depth which causes noisy collision between boat hull and stonework. The first line of defence when mooring are the slim pipe fenders, three each side of the boat hung from the cabin top rails. After tying up the Captain deployed the usual three squashy go-kart tyres as buffers between boat and side (second line of defence, but not with any great success). From the front deck now were brought the third line of defence, the pair of wheelbarrow tyres. Floated horizontally they keep the boat further away from the edge /ledge. It was a day of high bluster, the tree tops waving wildly in the wind – and the boat continued to bang. Back out onto the towpath the Captain went: ropes were adjusted and in a further attempt to gain a peaceful mooring the go kart tyres were forced between the wheelbarrow tyres and the bank. Would this (fourth line of defence!) provide a more peaceful mooring in an apparently tranquil spot? The afternoon passed, with just the occasional biff as the wind continued to blow – but the views were good. Mid-evening a disturbance of another kind occurred: rollicking along the canal came a boat hired from Middlewich for the weekend. In the bow, in fine voice, was the bride! Their passage along the cut didn’t go unnoticed. On the lock landing below the lock lurked a crippled boat (“waiting for an engineer,” another boater explained). Boatwif counted the waiting boats and made regular reports back to the queue behind. Then a crowd of bods gathered around the chamber and a teenage boy was seen clambering down and then back up the lock steps. A man with a trolley full of tools was amidst them. The story emerged: a dayboat with a crew of about seven had got a rope wrapped around the prop, the gearbox seal had broken and the gearbox oil had been lost. Engine-less the boat was bow-hauled into the lock and then hauled out once the lock was filled. While the crew crammed onto the small bow deck (for hot drinks on a damp morning) the engineer clambered down into the engine ‘ole and within half an hour or so he had restored power and propulsion to the boat. Boaters afloat on a Sunday are quite likely to encounter fishermen /women. The Captain hissed under his breath at discovering this angler slap bang in the middle of the lock landing below Crow’s Nest Lock. Three days later the fishing competition came back to mind. Cleddau was following a C&RT workboat out of Rode Heath. Two boats approached, one was familiar. The crew of the second boat, however, were clearly distracted by something. “The workboat’s stopped,” the helmsman said. “Boys ahead have just found a GUN!” And so they had – two young teenagers had been using a sea magnet in the water under a bridge, and had caught a gun… It (a revolver) was handed to the workboat crew. Further along at a C&RT depot five men pored over it. Another first, though not one crew members would aspire to repeat! Also to report in the Unexpected category is Sandbach – yes, Sandbach. 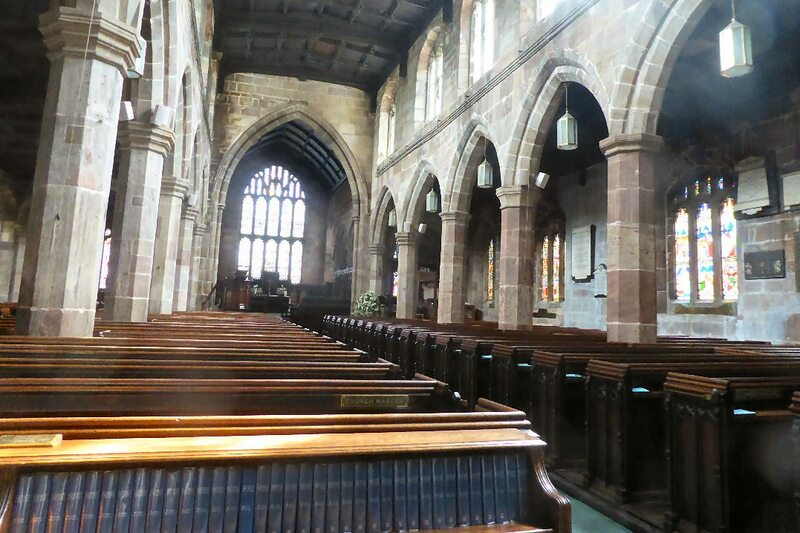 Two Saxon Crosses in this small Cheshire town are in the care of English Heritage, so they must be worth seeing. Heavy transport fans might recognise this town as the home of Foden and ERF Trucks, and the award winning Foden’s Brass Band is still based in Sandbach. These days there are plenty of places to take refreshment, but up until the late 19th century the Town Pump was still in use. very interesting to look at – and it tasted good too! And so, after overnight moorings outside Wheelock, at Hassall Green and at Church Lawton, Cleddau completed the climb back up Heartbreak Hill. No hearts were broken, although there was an alarming tale from another boater of how his wife is hospitalised with serious shoulder, elbow and hip injuries caused by falling six feet from the Red Bull lock down onto a stone path. Les and I loved Sandbach. There is an excellent deli at the south end of town just past where the bus comes in and there is a very good health food store there as well. The deli in Sandbach was the only place in this country i was able to procure Steel cut Oats AKA Pinhead Oats over here. I remember buying four bags of them there! Lovely memories and how quickly you moved from Nantwich all the way back to the Maccie! You two don’t ;et any moss grow on your bow!